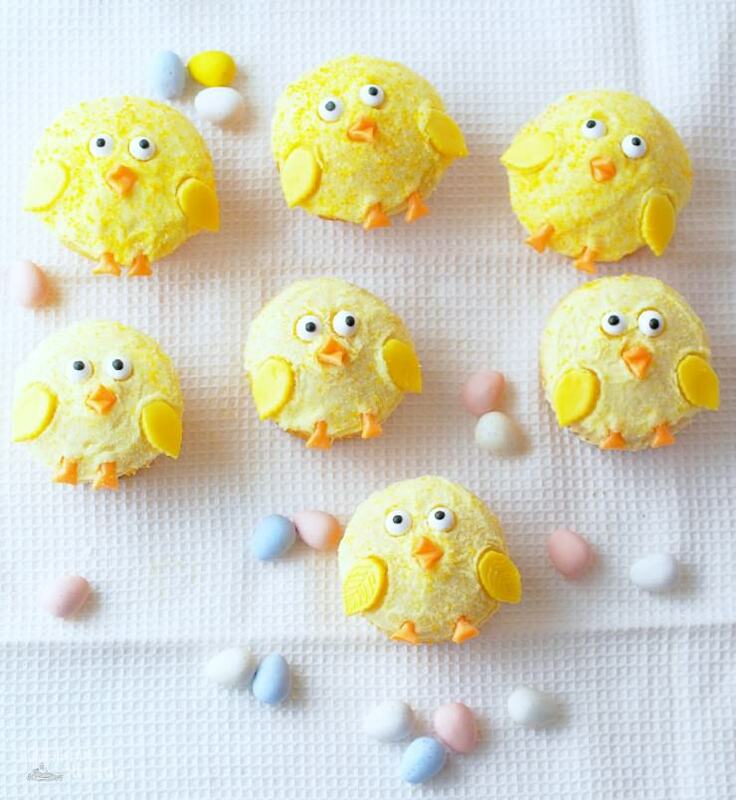 Baby Chick Cupcakes are bright lemon cupcakes all dressed up as baby chicks for sweet treats that are destined to bring a smile to Easter or baby shower dessert tables. Seriously, Friends…how ridiculously cute are these little cupcakes? With Easter just a few days away, the Sons were clamoring to do some sort of edible Easter craft in line with the Reindeer Cupcakes that we made for Christmas. As I’ve mentioned before, I’m not super crafty unless right inspiration hits. In this case, inspiration leapt from the page during my stealth-like browsing of a baby chick catalog. Did you know that there are whole catalogs filled with photos of adorable little chickens that can be shipped right to your front door? It’s true! I’ve taken to stalking reading these catalogs with the wild (read: unlikely) hope that Bacon Slayer will acquiesce to the idea of us raising our own flock. Just think of the life lessons that the Sons will learn about responsibility for others and animal husbandry! Besides, our family’s weekly egg consumption borders along the realm of the absurd. Doesn’t it make sense that we raise our own eggs? Not to Bacon Slayer it doesn’t. He never fails to throw a little shade my way at the mere mention of acquiring baby chicks. His steadfast assertion that we don’t need a flock of egg laying hens has never wavered. “We don’t need chickens. We have friends that raise chickens.” and “We have four kids and a dog. We don’t need any more animals.” are his favorite responses to my desire for chickens. Mind you, the last time he and I were at Tractor Supply Co., he grabbed me by the hand and led me to the baby chick area of the store to show me how cute they were. I interpret his last statement as Bacon Slayer practically agreeing that we will someday raise chickens. You know, because Son #1 has wanted a horse since birth and he shows no signs of letting that dream go. BS did say that he’d have chickens before a horse, so it stands to reason that we’d get chickens first and work on the horse later. It’s the natural order of things! In reality, I’m not sure if my beloved will ever relent to livestock on our property but that doesn’t mean that we’ll quit trying. For now, the Sons and I will have to be content with fulfilling our dreams of snuggling a clutch of baby cheeks by making these sweet Baby Chick Cupcakes. 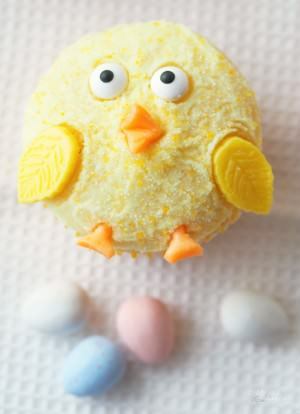 Baby Chick Cupcakes take bright lemon cupcakes and dress them up as baby chicks for cutest little treats that are destined to bring a smile to Easter and baby shower dessert tables. Best of all, the Baby Chick Cupcakes aren’t difficult or time consuming to make in bulk with enough helping hands. In the interest of full disclosure, I should mention that even though I have a really great lemonade cupcake recipe, I used a box lemon cake mix and canned lemon frosting for the purpose of this decorating project. 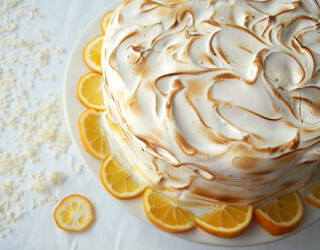 I figure that all the decorating was heroic enough without having to spend hours juicing and zesting lemons to make both the cake and frosting from scratch. I really wanted to spend the bulk of our time on the fun of decorating the cupcakes, and I don’t regret making fun the focus. My boys had a blast squishing the fruity candies to cut out the wings, beaks, and feet before assembling the cupcakes. I can easily see us employing the same method to make tiny cut-outs for use in place of fondant in other cake decorating adventures because it’s super easy and tastes so much better. I did my best to describe how to cut the shapes out of the candy for each of the decorating components, as well as including photographs of the process in the visual tutorial collage below. As always, feel free to comment or email with questions on the process, and I’ll answer as soon as I can. Happy Easter, Friends. Have fun with the cupcakes! Baby Chick Cupcakes are bright lemon cupcakes all dressed up as baby chicks for sweet treats that are destined to bring a smile to Easter and baby shower dessert tables. Frost the tops of each cupcake with lemon buttercream. Place the yellow colored sugar into a small bowl. Gently dip the frosted tops of the cupcakes into the sugar to coat; briefly set the sugar crusted cupcakes aside. To create wings for the chicks, use a rolling pin or large dowel to flatten one yellow Starburst fruit chew into a thin rectangle. Cut a pair of wings out of the flattened candy using a 1-inch oblong leaf-shaped cutter. (Alternately, two oblong shaped wings may be cut freehand using a paring knife.) Repeat with the remaining yellow candies to make 12 pairs of wings. Discard the extraneous cuttings. To create the beaks, flatten one orange Starburst fruit chew into a thin rectangle. Cut the rectangle into four equal, smaller rectangles. Clip the outer corners of one of the rectangles to form a diamond shape. Fold the diamond nearly in half crosswise. Pinch the two outer points of the fold to slightly pucker and form a small, open beak. Repeat with one of the other orange rectangles. At this point, you should have two little beaks. Discard the extraneous cuttings from the beaks, saving the other two rectangles to make the legs/feet. Use the other two orange rectangular pieces to make legs/feet by cutting each in half widthwise to create 4 small squares. Toward the middle of one of the squares, make two cuts a small distance apart, running halfway through the square—this will be the “leg” portion of the foot. On the other side of the square, make diagonal cuts from each corner toward the middle, just meeting the bottom edge of the first, creating half a diamond shape “foot” at the bottom of a skinny “leg” portion. Discard the extraneous cuttings. Repeat with the remaining orange candies, creating two beaks and four legs/feet from each candy. Once all of the parts have been made, begin assembling the baby chicks by placing two eyes close together in the center of each cupcake. Center a beak just below each pair of eyes. Place two legs/feet at the bottom edge of the cupcake, in line with the eyes. Set one wing onto each of the two horizontal edges of the cupcake. Repeat the decorating process with the remaining cupcakes until a dozen baby chicks are created. Serve immediately or store the decorated cupcakes in an airtight container at room temperature (70 degrees F or less) for up to two days before serving. 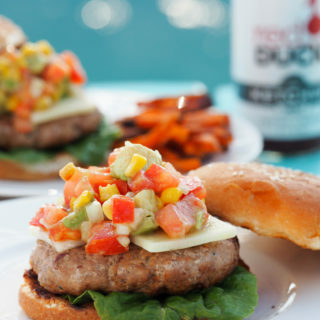 Follow Kirsten | Comfortably Domestic’s board ***Recipes: Holiday Party Food*** on Pinterest. I can not get over how cute these chick cupcakes are!!!! Every year my mom would beg my dad for baby chicks and my dad would say "No." Guess what....we always got chicks ;) hehehe. Good luck to your and your boys on getting the chicks and horse! So darned cute! Makes me wish I hadn't given up sugar! You are so creative and what lucky boys! I can't believe your husband would actually show you the cute baby chicks and then deny you chickens of your own! So very cruel :-) I have had chickens for many years and love them. Of course, with a dog there can be some challenges but your children will love them. New chores for them! These are so adorable! I have to make these for my kids for Easter! These are absolutely adorable. My daughter would be so excited to make these. These are just the cutest! 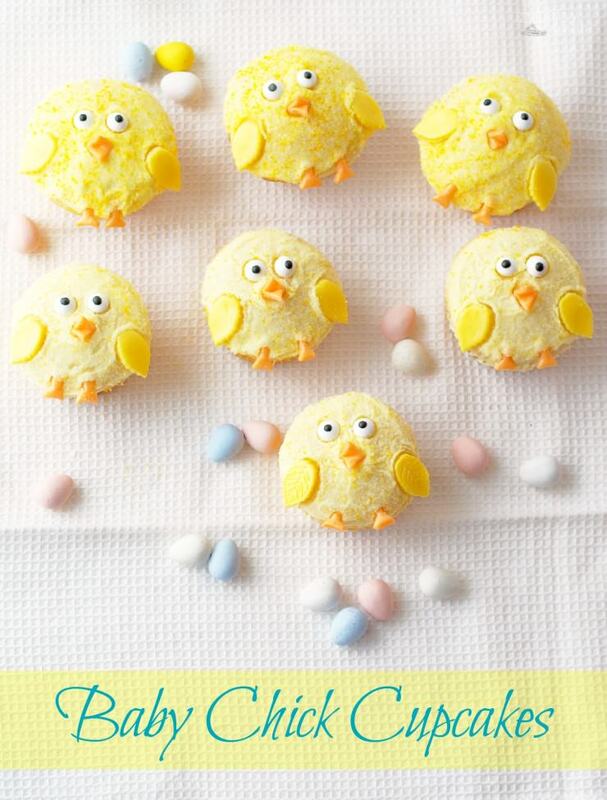 I bet these would be just adorable for Easter Dessert! I know quite few little ones that would love these! OMG! 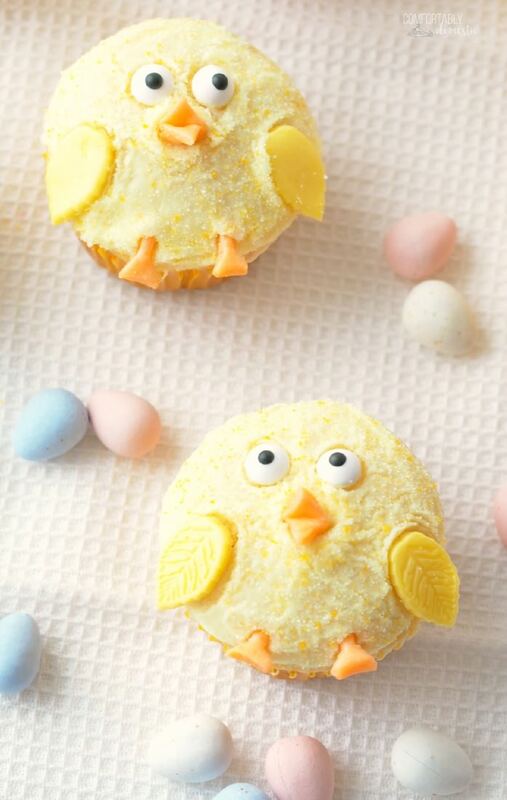 These chick cupcakes look so adorable! Not just to kids but to adults too. Feel a bit guilty nibbling them? But they are just that darn good! haha!